Could this cat BE any cuter? 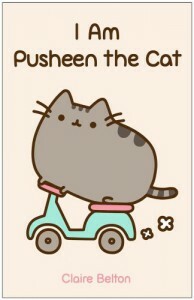 Pusheen the Cat never fails to put a smile on my face. I was familiar with this adorable kitty from Facebook and was glad to see this collection of cartoons available for review on NetGalley. I'm not a cat-owner, but I am owned by a pug, so many of the images are very familiar and entertaining. My six year old daughter enjoyed flipping through the pages right alongside me and declared Pusheen the Cat to be "absolutely adorbs!"